Cat and I played a two-player game of Trajan tonight and we both thought it really, really good. Cat rated it at least an 8 and I went for 9. There are so many ways to score victory points that it's very tricky to work out a best strategy. However, that and lots of opportunity for planning a number of moves ahead does mean turns can take a while if people are trying to optimise each step. In other words, if Guy's playing, you could be waiting a while for your turn. However, an excellent game that I can't wait to try with more than two. I played ten new games this month and they were all pretty good, although the solo game of Pax wasn't as challenging as the multiplayer version should be. 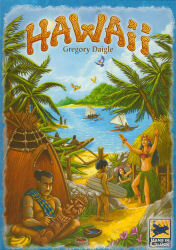 The others were Eminent Domain, 23, The City, TSCHAK!, Callisto, Innovation, Founding Fathers and Queen's Ransom but the winner by a smidgeon was the excellent Hawaii from Greg Daigle and Hans im Gluck. Picked up three new games from Gameslore on the way home tonight, although two of them are Christmas presents. 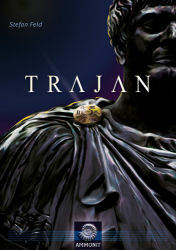 The other is the new Stefan Feld game, Trajan, which looks a really interesting game utilising a Mancala type mechanism. 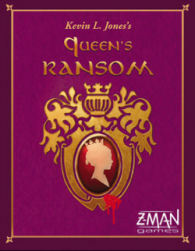 Played this nice little Z-Man card game tonight. Quick deduction game that I thought worked really well. Gets to the point where you think you need to guess otherwise it won't come round to you again. Three of us guessed wrongly, leaving Rebecca to work it out just before Chris would have done. Played this new filler game from Dominique Ehrhard and published by Gameworks tonight. We quite enjoyed it with lots of second-guessing going on. Nice that hands get passed around the table each round so everyone gets to play with good and bad hands before the game ends. Chris won by concentrating on getting the 3 gold with the last card each round. Nice 30 minute game. 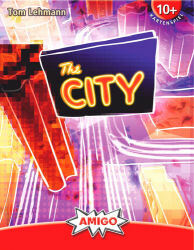 Chris and I played Tom Lehmann's The City yesterday with a very close finish. Sort of a light Race for the Galaxy, you build cards that generate income and/or victory points and it's a lightning fast race to 50 points. Chris reached 49 on his seventh turn and I just managed to get to 50 on that same turn. Took about 15 minutes. 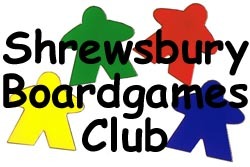 The venue for this coming Friday's session of the Shrewsbury Boardgames Club is Garry's House. My web host, Web Mania, has been doing some work over the weekend and it's made things a bit screwy. My Spiel site now comes up as a Boys Brigade site and, yesterday, this site appeared as a bookshop site. Although Trickylight is now back, the FTP server is down so I can't upload changes (like the venue for next week). Hopefully, this will get resolved pretty quickly but I thought I'd let everyone know. My final main shipment of Essen games arrived today from Germany via Allgames4You. 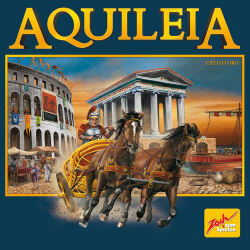 The ten games in this batch were Aquileia, Fortuna, Hawaii, Rapa Nui, Pax, Pergamemnon, Tschak! Mogel Motte, 23 and The City. That just leaves Poseidon's Kingdom to come from Fragor, once they let me have the delivery details. I collected another batch of Essen games this evening from Nick at Shire Games (plus a couple of non-Essen games). 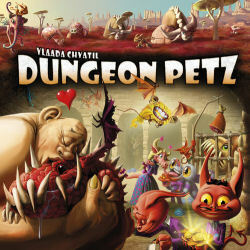 This batch included Dungeon Petz, Last Will, Innovation, Coney Island, Nefarious, Founding Fathers, Dungeon Raiders and Eminent Domain. 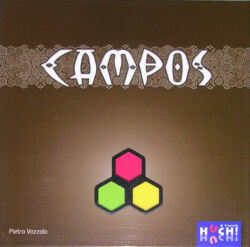 Collected my first shipment of Essen games from Paul at Gameslore on Monday. He hadn't managed to pick up as much on my list as I'd hoped but I cam away with Lost Temple, Revolver, Uskoci, Pret-a-Porter and Panic Station. 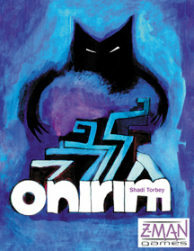 I played Onirim a couple of times last year as a solo game but couldn't manage to beat it. Played again tonight and succeded at last (basic game only). i think I worked out that discarding cards, especially keys, can be helpful once you've discovered the doors of that colour (obvious really). It also helped that the nightmares didn't crop up as early as the last two attempts. Nice game. Several heavily discounted games have started appearing in branches of The Works and, although the Shrewsbury store hasn't received anything of note, Catherine was in Hanley today and picked up Albion for me for £7.99 (Albion being the only of the sale games I don't already have. Rebecca went back to Keele yesterday so I took the opportunity to visit Nick at Shire Games. 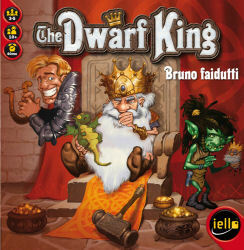 Picked up a copy of Discworld: Ankh-Morpork and Bruno Faidutti's Dwarf King. In London today and tomorrow so visited Orc's Nest with the intention of picking up Discworld: Ankh Morpork. Ended up leaving that behind (still not sure if it might de-generate into peope working out what everyone's victory condition is and then playing to stop the next person winning). Instead, opted for King of Tokyo and then also picked up Reiner's co-operative Star Trek: Expeditions from Forbidden Planet. Looks fabulously produced and am hopeful it's going to be a really nice experience game. A bad month for me for playing new games and, until this evening the only new title I'd played (which would have become Game of the Month by default) was Pirate Fluxx. Thankfully, Chris and I played a two player game of Maori, which was pretty good, although having now played it once, our next game will involve a lot more forethought about depriving the other player of useful tiles. Still, we enjoyed it enough for it to gain the Game of the Month title for August. I must play more new games in September. Just back from a week's holiday in Tuscany and managed to visit a good game shop in Florence called Stratagemma. Prices were a bit high but I had to purchase something so I opted for 7 Wonders: Leaders. It was nearly the game I had for the shortest time in my collection as I managed to leave it on the tour bus on the way back to the hotel but the Thomson rep pulled out all the stops and got it back to me just as we were leaving. Phew! Just a note to make sure everyone knows that we all have unlimited transfers up to the week 2 deadline due to the technical problems on the FPL website over the weekend. The explanation is here. 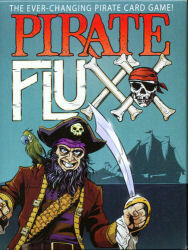 Rebecca came home today from a week's holiday in Cornwall and brought me back a present of Pirate Fluxx! Played it tonight and it's just the same as ordinary Fluxx but you get to speak like a pirate all game. Arrr! We played two quick games, five player, won by Jan and Chris. I like the way this game plays but have moved my rating down a notch as you are very much at the mercy of the cards you draw. Catherine and I played yesterday and I was able to play all mine for pretty good scores. Catherine got stuck with two or three cards that were unplayable until right near the end. I'd possibly add an option to swap cards by forfeiting a turn. Well, I do when playing Felix: The Cat in the Sack which Jan, Catherine and I played this evening. 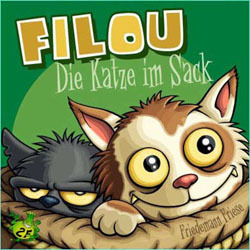 It's a really nice, clever auction/bluffing game but I got every bad sack of cats going and ended up with a massive 4 points (having started with 15). Jan won with 59 and Cat was close behind on 53. At the end of last night's Shrewsbury Boardgames Club session, we managed to fit in an extra game. Mark W, Mark K, Pete and I had playtested the interesting dexterity game, Push Pete's Car. Some interesting mechanics in this one but the wheels came off, enjoyment-wise, when the car's engine jumped into life. Not sure whether we count it as a four-way win or a four-way loss. I played five new games in July - Wars of the Roses: Lancaster vs York, Pantheon, Lancaster, The Struggle for Catan and Olympos. They were all pretty good but Pantheon was the clear winner. 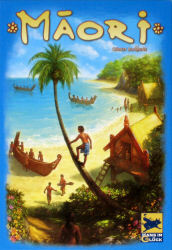 Another fine game from Bernd Brunnhofer after Saint Petersburg and Stone Age. Well, the poll didn't turn out to be as successful as it might have been. There ended up being a grand total of 7 votes but 2 of those were mine when I was testing it out. 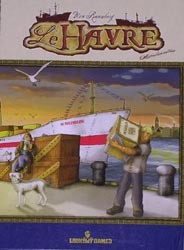 So by a huge margin of 3 votes to 2, Le Havre was the game we prefer to play between it and Agricola. I might do another poll at some point in the future but I wouldn't hold my breath. 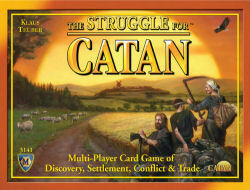 Played Struggle for Catan last night 2 player with Jan. Nice and streamlined and works very well. Not sure if it isn't too well balanced though. Scores ended up 10-9 to Jan. Interesting to see how it plays with three or four players. Just added a new Bitz Quiz to the site, the first for over four years. 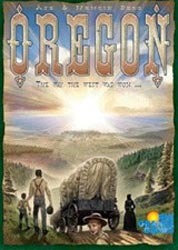 Twenty images from the box covers of mostly well-known games. 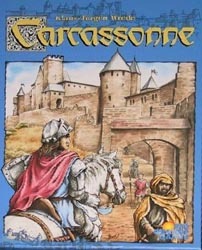 Downloaded the Android implementation of Carcassonne and played a couple of three player games. Works pretty well on a 10" screen. I managed to win both games so question mark over how strong the AI is but should get some more fun out of it on train journeys. 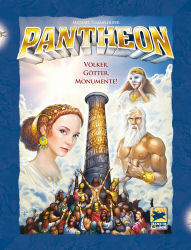 Played Pantheon with Chris this afternoon and we both thought it was very good. Even though I since found out we played a rule wrong which made money too tight and made the game last longer than it should have. 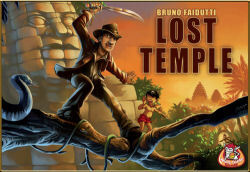 Another excellent game from Bernd Brunnhofer after Saint Petersburg and Stone Age. In the last week, I've managed to play three of my remaining unplayed games: Carpe Astra, Coach Ride to Devil's Castle and LotR:TCG (five times solo for the last of these) and I've sold Ark Extra Mix and I'm back down to just 10 games unplayed. Hopefully, with game night tomorrow, it'll go even lower. 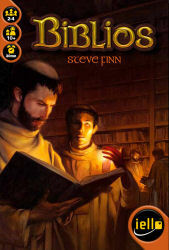 Jan and I played a 2 player game of Biblios (the new version of Scripts & Scribes) last night and we both really enjoyed it. It plays really quickly, the decision making isn't too difficult but isn't trivial and the scoring at the end was tense, with a surprising outcome in our game as the suit that I had banked on being my strongest turned out to be inferior to Jan's, costing me the game. Doh! Good fun though. 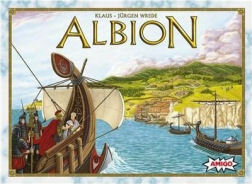 I've posted a quick note on games played in 2010 on my Spiel website and my Six Picks for the year are also announced. Played a number of decent new games this month and probably expected Troyes to be my pick for December. 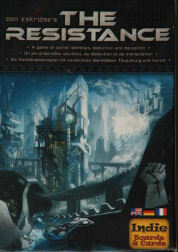 However, I really, really enjoyed The Resistance, a social deduction game that works really well with five and will take up to ten players.